The report accompanying a new House appropriations bill expresses "profound disappointment" in NASA and its contractors for the latest JWST overruns. WASHINGTON — A new appropriations bill the House plans to vote on next week would provide $21.5 billion for NASA in 2019 but warns that any further problems with the James Webb Space Telescope could lead to its cancellation. House leadership announced late Jan. 17 that they plan to introduce a package of spending bills for most of the government agencies currently affected by the ongoing shutdown, now nearly a month old. The bills will be taken up by the House the week of Jan. 21, House Majority Leader Steny Hoyer (D-Md.) said in a statement. That package of bills includes a commerce, justice and science (CJS) spending bill that provides $21.5 billion for NASA. That is slightly less than last year's House bill but above the $21.323 billion that the Senate version, passed by the House earlier this month, provided for the agency. That bill includes the full $304.6 million requested for JWST in 2019, but the report accompanying the bill offered harsh language, and a warning, regarding the space telescope given the cost overruns and schedule delays announced last year. "There is profound disappointment with both NASA and its contractors regarding mismanagement, complete lack of careful oversight, and overall poor basic workmanship on JWST," the report states. "NASA and its commercial partners seem to believe that congressional funding for this project and other development efforts is an entitlement, unaffected by failures to stay on schedule or within budget." The bill does increase the cost cap for JWST by about $800 million, to a little more than $8.8 billion, to address the latest overruns. 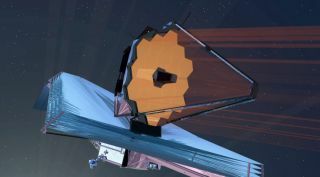 "NASA should strictly adhere to this cap or, under this agreement, JWST will have to find cost savings or cancel the mission," the report states. The report language is the first formal reaction by congressional appropriators to the final report of the independent review board last June, which projected that JWST would not be ready for launch until March 2021. The House and Senate had completed their original versions of CJS spending bills prior to the release of that report. In exploration, the bill funds most of NASA's request for new initiatives, including development of a facility in cislunar space that bill calls the Lunar Orbital Platform but more commonly called the Gateway by NASA. However, the bill prevents NASA from spending more than half of the allocated funds for the Gateway, advanced cislunar technologies, lunar science programs as well as a new commercial low Earth orbit development effort until NASA submits a multi-year exploration plan to appropriators. The bill preserves funding for NASA's Europa Clipper mission and a follow-on lander, priorities of former Rep. John Culberson (R-Texas), who chaired the appropriations subcommittee that funded NASA but lost reelection in November. The bill includes $545 million for Europa Clipper and $195 million for the lander. However, it moves back the launch dates for each by a year, to 2023 for Europa Clipper and 2025 for the lander. While the bill may pass the House, its fate in the Senate is less clear. Senate Majority Leader Mitch McConnell (R-Ky.) has declined to take up either the omnibus spending bill the House earlier passed or other spending measures, such as a short-term continuing resolution, saying he won't consider such bills unless they're likely to be signed by the president. The White House has pushed for an additional $5 billion for building a wall on the southern border, a measure rejected by Democrats. The package of bills announced by Democrats does not include the Department of Homeland Security, where the border security funding would be allocated. "We should pass this bill, reopen the government, and pay our federal employees," Rep. Nita Lowey (D-N.Y.), chairwoman of the House Appropriations Committee, said in a Jan. 17 statement of about the new spending bill package. "After we do that, we can have robust negotiations on border security and immigration policy."